President Barack Obama and first lady Michelle Obama paid too much in taxes last year compared with their peers in the same income group, says Dorothy Brown, professor of tax law at Emory University School of Law. In an article published today in Tax Notes, Brown says that the Obamas made more than $5 million last year and paid 32 percent in federal income taxes, while "most households with adjusted gross incomes of at least $5 million paid only 23 percent in federal income taxes." The reason for the difference, she adds, comes down to how the money was earned. "The typical taxpayer with $5 million of income received almost half of it from capital gains and qualified dividends, which are taxed at a lower 15 percent rate," writes Brown. "That is why their tax rate is 23 percent. "The Obamas, however, had a negligible amount (less than $2,500) of income subject to the 15 percent rate, with the rest of their income subject to the maximum 35 percent rate. That is why their tax rate was 32 percent." Brown says the Obamas are not alone in being taxed too much. "Most of us do not benefit greatly from the 15 percent rate" of taxation on capital gains, she writes. Most people with incomes between $50,000 and $100,000 have no more than 3 percent of their income from capital gains, she says, and taxpayers in the $100,000-$200,000 income bracket have no more than 6 percent of income from capital gains. "Should someone who receives $5 million in royalties from a book he worked long and hard to write and get published pay taxes at a higher rate than someone who receives $5 million by taking her stockbroker's advice in deciding when to buy and sell stock?" asks Brown. "Put another way, should someone who works a 40-hour week and is busy trying to raise a family pay more in taxes than someone who never gets out of bed but earns the same money from going to the mailbox and getting a dividend check (or just going to the computer and checking their account online)?" Brown asks. "All income should be taxed the same," she argues. "No type of income should get preferential treatment." Those who support lower taxes on corporate dividends argue that that income has already been taxed once at the corporate level. "What they fail to tell you is that in some instances that income has never been taxed at the corporate level," Brown says. And while lower taxes on capital gains generates additional government revenue in the short term, Brown argues that in the long term, "the government loses lots of money from capital gains rate cuts." 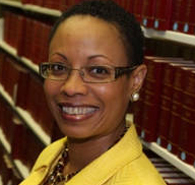 Brown specializes in federal tax law and critical race theory and is known for her work examining the racial implications of federal tax policy. She has been an adviser to J. Stephen Swift of the U.S. Tax Court, an associate with Haynes & Miller in Washington, D.C., and an investment banker at New York's Drexel, Burnham & Lambert. She also was a special assistant to the Federal Housing Commissioner at the U.S. Department of Housing and Urban Development.